Cover of the 1987 printed version, designed by FWP, based on the cover of the :tilismaat-e ((ajaa))ib, an old book of magic and wonders from the Naval Kishor Press. We said at the end of Chapter 8 in the original print edition (1987) that real ahl-e zabaan were made and not born. That may have been only partially the case then, but it's all too true by now. Traditionally-educated ustads are a dying breed. Classical Urdu poetry, like so much else, belongs less and less to those who simply inherit it, and more and more to those who seek it out and adopt it for their own. The very forces that have deprived us of traditionally-educated ustads, however, have brought us the internet. Now Urdu poetry is international, and we can share with each other across time and space. And of course we still have Mir and Ghalib, and so much else besides. So dig in, you ahl-e zabaan of the future, and learn to use the tools. Classical ghazal poetry is an astonishing delight. The rewards are so rich that you won't exhaust them in a lifetime. This handbook is designed to be of use to English-speaking students of Urdu poetry. Above all it will be helpful to those students for whom English is a native language. One of the authors is such a student, while the other has been teaching such students for years. We have written the kind of book we can best use ourselves, for our own work; other students and teachers have also found our approach helpful. Our method does not assume a native speaker's instinct, an intuitive perception, or an "ear" for poetry. Even a completely tone-deaf and unintuitive student can learn to scan Urdu poetry with great accuracy. And a student who does have an "ear" can also learn to hear, recite, and enjoy the oral rhythms of the poetry as immediately as any native speaker. A determined student can even compose metrically correct verse himself; a number of Westerners have done so. We do, however, assume the student's ability to understand the words of a poem in their normal prose sense, and to pronounce them carefully and correctly. This does not mean that only advanced students should study poetry. On the contrary: we feel strongly that even beginning students can enjoy poetry, and can profit by exposure to it. But the poetry chosen for study should be suited to the student's background. The student who cannot recognize and pronounce most of the words of a poem, and cannot generally understand their grammar, cannot properly scan that poem. No method can enable him to do so, and certainly not ours. Such a student needs a good dictionary, a good teacher, or an easier poem; he must generally understand the poem's words in order to correctly evaluate its meter. Another sort of student who can profitably use our method is the native speaker of Urdu (or the Hindi-speaker who has learned Urdu script) who has a serious interest in recitation or composition, but finds traditional Urdu poetics intimidating. Virtually all existing accounts of Urdu meter start with the elaborate metrical systems of Arabic and Persian poetic theory. These systems are complex enough in themselves, and must be further modified to suit a language for which they were not originally intended. Our method differs from traditional accounts in being completely descriptive and practical; it is designed to meet the immediate needs of the student, rather than to explicate the orthodox system or to develop any other comprehensive theory. Our method starts with the poetry as actually encountered, and explains its scansion in what we think is the simplest and most efficient way. The native speaker who prefers poetry to poetic theory will find our handbook convenient. Finally, we hope that our work will be of interest to those fully conversant with traditional Urdu poetic theory. It may offer a few new perspectives, and suggest different ways of looking at familiar phenomena. The first draft of this handbook was compiled during the course of the Berkeley Urdu Language Program in Pakistan, 1979-1980, and our earliest debts are to people associated with that program. The Program owes its long and healthy career to Professor Bruce Pray of the University of California at Berkeley, who has been a friend and counsellor to us both. Dr. Ruth Laila Schmidt, Field Director for 1979-1980, arranged for us to have the time and freedom for this project. One of the Program's teachers, Arif Vaqar, and one of its participants, Mark S. Pegors, took an especially strong interest in the project, and their continuing suggestions and criticisms were most helpful. All those involved in the Program encouraged us, and gallantly endured the hours of heated discussion which we inflicted upon them. In particular we thank Altaf Fatima, who has been a very good friend to us both, for her counsel, encouragement, and many cups of tea. After the first draft of the book was prepared in Lahore during 1979-1980, circumstances made it impossible for the authors to work together in completing it: Frances Pritchett had to return to the United States, while Khaliq Ahmad Khaliq remained in Lahore. The later drafts, including the final one, were therefore prepared by F. Pritchett after her return to the United States. Although Khaliq Sahib has had a chance to see them in a general way, the final responsibility for the shape of the book, and for any errors it may contain, must be borne by F. Pritchett. She thanks all her Urdu students at Columbia University who have made use of the successive drafts of this book and contributed their suggestions; Randolph Thornton in particular has taken a serious interest in the project. Above all, the handbook owes incomparably much to the close scrutiny given it by Shamsur Rahman Faruqi, who is, among many other distinctions, perhaps the best modern authority on Urdu meter. Faruqi Sahib was kind enough to prepare extensive notes which became the basis for our discussion of feet and meters, and to suggest appropriate entries for the Bibliography. He also gave us the benefit of his advice and criticism throughout. The chance to draw on his specialized knowledge in this field was invaluable, and we are most grateful. We also thank Professor Gopi Chand Narang, of Delhi University; Professor M. A. R. Barker, of the University of Minnesota at Minneapolis; and Professor Ralph Russell, formerly of the School or Oriental and African Studies of the University of London, for their most valuable comments and suggestions. Professors Muhammad Umar Memon and Narayana Rao of the University of Wisconsin at Madison have also given encouragement and help to the project. 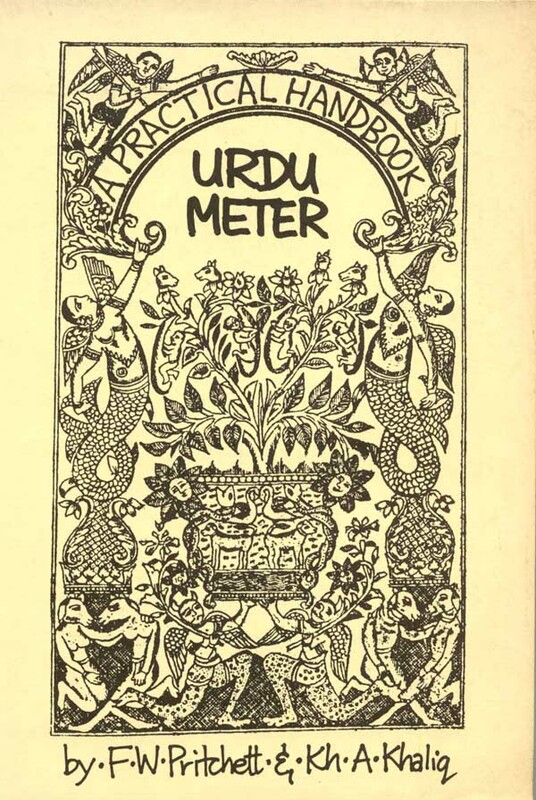 The elegant and beautiful Urdu script which appears in this volume is generated by a program called "Khushnavis," designed by Professor Donald Becker of the University of Wisconsin at Madison. Professor Becker was most generous with his help in preparing the manuscript and designing its printed format, and the book owes him the ultimate debt: it could not have existed in its present form without his work.